Mortgages aimed at first-time buyers that require a 10% deposit are to be offered by a revamped Post Office, the government has said. The institution will start to offer financial products from its network of 11,500 branches within the next year. The government has announced more details to the plans which were first outlined last autumn. It also said that funding will keep the branch network at "around its current size". The plans also include the provision of children's accounts, and an account that allows those on low incomes to manage their household bills. However, a date has not been set for every planned new service. The Post Office has more branches than all of the High Street banks combined. The first of the new services - a children's savings account - will be introduced in the next 12 months, the government said. The mortgage product, backed by the Bank of Ireland, will also be introduced within the next year. But some of the other proposals have not yet been given a firm introduction date. For example, the supply of a current account will only happen when the Post Office considers the market conditions to be suitable. More negotiations were needed before a time commitment was made for the launch of the new weekly budgeting account, a spokesman for the Department for Business said. This would allow people on low incomes to hold an account which they could use to pay household bills and take advantage of the discounts available through paying by direct debit. There are also plans for business people to access their accounts through Post Office branches. "The Post Office can provide a range of good value, simple financial products for everyone," said Business Minister Pat McFadden. "These are the clear messages that people have given us and we are acting on them - a major step towards making the Post Office a sustainable neighbourhood banking service." A consumer watchdog welcomed the changes, but called for a new basic bank account to be introduced quickly. "Consumer Focus research shows that many on low incomes do not trust banks but do trust the Post Office, and that up to one million people could be lifted out of financial exclusion by a Post Office basic bank account," said Andy Burrows, of Consumer Focus. "Government must take this opportunity and introduce a basic bank account - which would be simple to use, convenient and work for those on low incomes. It cannot just be an off-the-shelf copy of existing bank accounts. "We hope this is the first step towards the Post Office becoming a proper neighbourhood bank: accessible in towns and the countryside and open to all." The National Federation of SubPostmasters raised some concerns about the partnership with the Bank of Ireland, arguing that more needed to be done to make the Post Office network sustainable. "Half of all profits made on existing financial service products leave the Post Office," said general secretary George Thomson. "The Federation believes that a British-backed Postbank model would allow all profits made by the Postbank to be retained by the Post Office, which is by far the best solution to sustain the future of the network." For the Conservatives, shadow business secretary Ken Clarke said the move was "too little, too late". "Labour have had 13 years to reform the Post Office, but have allowed it fall into decline with over 6,000 closures as a result," he said. "Conservatives will prevent the closure of any profitable Post Office, reform the Post Office Card Account to help with utility bills, free up Sub-postmasters and allow branches to offer a wide range of business services. We have led the way with energy and new ideas to ensure they have a future." 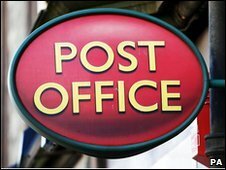 Liberal Democrat business spokesman John Thurso said: "The case for a Post Bank is compelling after years of neglect and Post Office closures by Labour. "The government's apparent deathbed conversion will be greeted with a large dose of scepticism by local campaigners whose views have long been ignored. "This is a very small step in the right direction towards keeping Post Offices open and giving this vital network a sustainable future."